The 68th Street Crib was built in 1892, and supplied two tunnels. The first tunnel with a diameter of 20 feet supplied the Jardine Water purification plant which was at one time the largest purification plant in the world. A second smaller tunnel of 10 foot diameter supplied the South water purification plant. 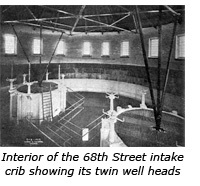 To increase inflow to the city, a second crib, known appropriately as the “Intermediate Crib” was established on the line from the 68th Street tunnel system in 1909. While building this crib on January 20 of that year, 70 out of the 106 men working on the crib’s construction were killed in a devastating fire which ravaged the structure. Unfortunately, with the weather being particularly bad at the time of the fire, the supply tug which was normally moored at the site throughout construction had been relocated to the harbor, and thus there was no way to take any of the crewmembers off. There was concern voiced that dynamite stored in the crib had exploded, but a number of witnesses at the hearing testified that they did not hear any explosion. This Intermediate Crib is no longer in existence. 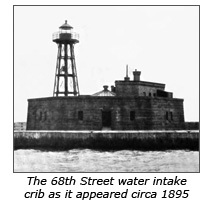 The 68th Street Cribs' light was exhibited from a silver gray lantern atop a red cylindrical tower located at top dead center of the well room roof. Equipped with a 60 candlepower 300 mm acetylene burner within a 300mm optic, the light sat at a focal plane of 60 feet with a range of visibility of 8 miles during clear weather. The fog signal was made on a bell with an automated striking apparatus emitting a characteristic single stroke every 12 seconds. Chicago’s population and industrial base continued to burgeon at the dawn of the twentieth century, and it was clear that additional capacity needed to be added to the existing supply. 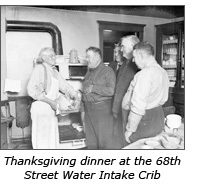 Rather than building a new intake crib at a remote area which would require the addition of another crew of keepers and living quarters, in 1909 the decision was made to erect a second crib adjacent to the existing 68th Street crib, allowing the existing keepers of the 68th Street crib to man both installations, thereby significantly reducing operating costs on an ongoing basis. 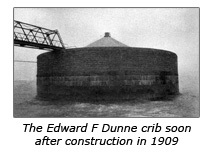 Known as the Edward F Dunne crib, this new structure was named in honor of Edward Fitzsimmons Dunne who was serving as Mayor when the plans for the structure were approved, and who would subsequently go on to become Governor of the state of Illinois. This new crib stood 110 feet in diameter, and was located in 32 feet of water. 25-foot thick stone walls housed a 60 foot diameter well which in turn housed a pair of fourteen foot diameter intake pipes which connected to a set of new tunnels connecting to a pair of new pumping stations on shore. A steel foot bridge spanned the 45-foot distance between the two cribs, allowing the keepers to pass easily between the two structures. Because the well lighted 68th Street crib was located so close, it was deemed unnecessary to install any aid to navigation equipment – representing an additional minor cost saving. The illumination source was changed to electricity in 1923 without any change in characteristic or range of visibility. Because all of Chicago's intake cribs are located in the lake beyond the breakwater system, only very distant views can be obtained from anywhere on shore and a private boat or charter boat represent the most realistic way to view these structures. Both the Great Lakes Lighthouse Keepers Association and the United States Lighthouse Society offer infrequent tours of the suth end of Lake Michigan, both of which have always provided great close-up views of this and the other water intake cribs. Copyright Terry Pepper. This page last modified 09-03-2012.